Students from INTI International College Penang celebrated a tremendous victory when they were named Second Runner Up at the Laureate Award for Excellence in Robotic Engineering competition. The third installation of this annual competition witnessed 38 teams from 13 countries vying for the title. 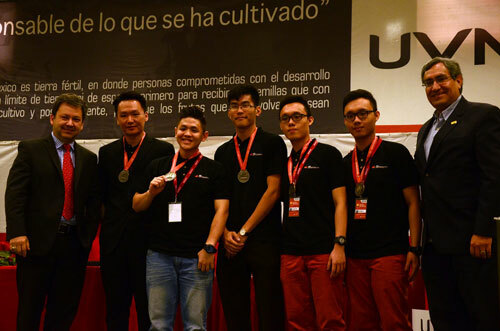 Six teams were selected for the final competition which was held in Mexico City from 3 – 5 May 2016, including INTI’s team from its School of Engineering and Technology – namely Lee Gang Ying, Lee Gang Lin, Law Yoke Lee and Chew Hong Zen. “All four of our students were in the midst of pursuing their internships, and much of their work was carried out only after working hours and late into the night. 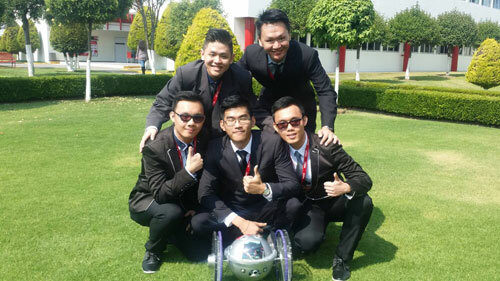 We are proud of their dedication and efforts in taking up the challenge of designing a robot which is able to rival competitors on a global scale,” said Johnny Wong, the Head of Programme for Engineering and team advisor. INTI’s robot, which is designed to carry out search and rescue missions in critical situations such as earthquakes and floods, required significant testing and development. While small, the robot not only needed to be sturdy but also waterproof and flexible to navigate different types of terrain. During the simulation phase of the final competition in Mexico, the judges – Dr Luis Navarro, Senior Project Scientist at Carnegie Mellon University and Carlos Pardo, a Manager of TelefonicaSoluciones, a global organisation with presence in 21 countries – complimented the students on their innovative design and impactful presentation, as well as their noble efforts to safeguard human life. “At INTI we strive to inculcate our students with the skills and qualities that will prepare them towards becoming the dynamic leaders of the future. In tandem with academic excellence, we believe education should empower them to meet the needs of tomorrow’s world. Through global opportunities such as this Award for Excellence, we are enabling our students to develop their capabilities while still studying which gives them an edge in today’s competitive workplace,” concluded Dr Michael Yap, Chief Executive of INTI International College Penang.